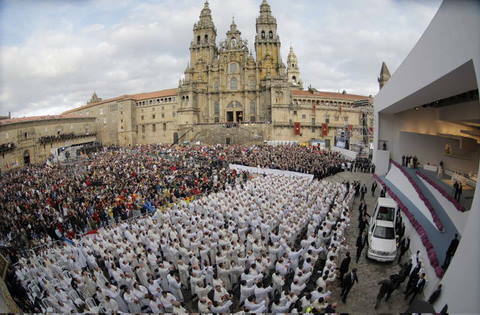 The first Mass of the Pope's Apostolic Visit to Spain took place in Obradoiro Square next to the Cathedral of Santiago de Compostela. The square was filled to capacity with over 7,000 people present, including an estimated 600 priests and 100 Cardinals and Bishops. Another 20,000 people were in the vicinity for the event. The Archbishop of Santiago de Compostela welcomed the Holy Father in the local Galician language. In his address, the Archbishop warmly thanked the Pope for his visit, saying that their desire to have him join them had finally come true. He called Pope Benedict a pilgrim of faith and witness of the risen Christ. He reflected on some of the oldest Christian pilgrimages in our history. He said Jerusalem, Rome and Santiago are routes for the man who refuses to choke on materialism. He reiterated Pope Benedict's earlier remarks inside the Cathedral; that the country of Spain needs a revitalization of its faith. He says the Church is Spain must find the strength to go on a pilgrimage to re-evangelize. The music throughout the Mass was performed by the Royal Philharmonic Orchestra of Galicia, accompanied by the Choir of the Cathedral of Santiago de Compostela. The music was all performed in a classical style, known to be the Pope's favourite type of music. One of their pieces was a beautiful rendition of Mozart's Kyrie Eleison. I give thanks to God for the gift of being here in this splendid square filled with artistic, cultural and spiritual significance. During this Holy Year, I come among you as a pilgrim among pilgrims, in the company of all those who come here thirsting for faith in the Risen Christ, a faith proclaimed and transmitted with fidelity by the apostles, among whom was James the Great, who has been venerated at Compostela from time immemorial. I extend my gratitude to the Most Reverend Julián Barrio Barrio, Archbishop of this local church, for his words of welcome, to their Royal Highnesses the Prince and Princess of Asturias for the kind presence, and likewise to the Cardinals and to my many Brother Bishops and priests here today. My greeting also goes to members of the Camino de Santiago group of the European Parliament, as well as to the national, regional and local authorities who are attending this celebration. This is eloquent of respect for the Successor of Peter and also of the profound emotion that Saint James of Compostela awakens in Galicia and in the other peoples of Spain, which recognizes the Apostle as its patron and protector. I also extend warm greetings to the consecrated persons, seminarians and lay faithful who take part in this Eucharistic celebration, and in a very special way I greet the pilgrims who carry on the genuine spirit of Saint James, without which little or nothing can be understood of what takes place here. With admirable simplicity, the first reading states: “The apostles gave witness to the resurrection of the Lord with great power” (Acts 4:33). Indeed, at the beginning of all that Christianity has been and still is, we are confronted not with a human deed or project, but with God, who declares Jesus to be just and holy in the face of the sentence of a human tribunal that condemned him as a blasphemer and a subversive; God who rescued Jesus from death; God who will do justice to all who have been unjustly treated in history. The apostles proclaim: “We are witnesses to these things and so is the Holy Spirit whom God gives to those who are obedient to him” (Acts 5:32). Thus they gave witness to the life, death and resurrection of Christ Jesus, whom they knew as he preached and worked miracles. Brothers and sisters, today we are called to follow the example of the apostles, coming to know the Lord better day by day and bearing clear and valiant witness to his Gospel. We have no greater treasure to offer to our contemporaries. In this way, we will imitate Saint Paul who, in the midst of so many tribulations, setbacks and solitude, joyfully exclaimed: “We have this treasure in earthenware vessels, to show that such transcendent power does not come from us” (2 Cor 4:7). Beside these words of the Apostle of the Gentiles stand those of the Gospel that we have just heard; they invite us to draw life from the humility of Christ who, following in every way the will of his Father, came to serve, “to give his life in ransom for many” (Mt 20:28). For those disciples who seek to follow and imitate Christ, service of neighbour is no mere option but an essential part of their being. It is a service that is not measured by worldly standards of what is immediate, material or apparent, but one that makes present the love of God to all in every way and bears witness to him even in the simplest of actions. Proposing this new way of dealing with one another within the community, based on the logic of love and service, Jesus also addresses “the rulers of the nations” since, where self-giving to others is lacking, there arise forms of arrogance and exploitation that leave no room for an authentic integral human promotion. I would like this message to reach all young people: this core content of the Gospel shows you in particular the path by which, in renouncing a selfish and short-sighted way of thinking so common today, and taking on instead Jesus’ own way of thinking, you may attain fulfilment and become a seed of hope. The celebration of this Holy Year of Compostela also brings this to mind. This is what, in the secret of their heart, knowing it explicitly or sensing it without being able to express it, so many pilgrims experience as they walk the way to Santiago de Compostela to embrace the Apostle. The fatigue of the journey, the variety of landscapes, their encounter with peoples of other nationalities - all of this opens their heart to what is the deepest and most common bond that unites us as human beings: we are in quest, we need truth and beauty, we need an experience of grace, charity, peace, forgiveness and redemption. And in the depth of each of us there resounds the presence of God and the working of the Holy Spirit. Yes, to everyone who seeks inner silence, who keeps passions, desires and immediate occupations at a distance, to the one who prays, God grants the light to find him and to acknowledge Christ. Deep down, all those who come on pilgrimage to Santiago do so in order to encounter God who, reflected in the majesty of Christ, welcomes and blesses them as they reach the Pórtico de la Gloria. From this place, as a messenger of the Gospel sealed by the blood of Peter and James, I raise my eyes to the Europe that came in pilgrimage to Compostela. What are its great needs, fears and hopes? What is the specific and fundamental contribution of the Church to that Europe which for half a century has been moving towards new forms and projects? Her contribution is centred on a simple and decisive reality: God exists and he has given us life. He alone is absolute, faithful and unfailing love, that infinite goal that is glimpsed behind the good, the true and the beautiful things of this world, admirable indeed, but insufficient for the human heart. Saint Teresa of Jesus understood this when she wrote: “God alone suffices”. Tragically, above all in nineteenth century Europe, the conviction grew that God is somehow man’s antagonist and an enemy of his freedom. As a result, there was an attempt to obscure the true biblical faith in the God who sent into the world his Son Jesus Christ, so that no one should perish but that all might have eternal life (cf. Jn 3:16). The author of the Book of Wisdom, faced with a paganism in which God envied or despised humans, puts it clearly: how could God have created all things if he did not love them, he who in his infinite fullness, has need of nothing (cf. Wis 11:24-26)? Why would he have revealed himself to human beings if he did not wish to take care of them? God is the origin of our being and the foundation and apex of our freedom, not its opponent. How can mortal man build a firm foundation and how can the sinner be reconciled with himself? How can it be that there is public silence with regard to the first and essential reality of human life? How can what is most decisive in life be confined to the purely private sphere or banished to the shadows? We cannot live in darkness, without seeing the light of the sun. How is it then that God, who is the light of every mind, the power of every will and the magnet of every heart, be denied the right to propose the light that dissipates all darkness? This is why we need to hear God once again under the skies of Europe; may this holy word not be spoken in vain, and may it not be put at the service of purposes other than its own. It needs to be spoken in a holy way. And we must hear it in this way in ordinary life, in the silence of work, in brotherly love and in the difficulties that years bring on. Europe must open itself to God, must come to meet him without fear, and work with his grace for that human dignity which was discerned by her best traditions: not only the biblical, at the basis of this order, but also the classical, the medieval and the modern, the matrix from which the great philosophical, literary, cultural and social masterpieces of Europe were born. This God and this man were concretely and historically manifested in Christ. It is this Christ whom we can find all along the way to Compostela for, at every juncture, there is a cross which welcomes and points the way. The cross, which is the supreme sign of love brought to its extreme and hence both gift and pardon, must be our guiding star in the night of time. The cross and love, the cross and light have been synonymous in our history because Christ allowed himself to hang there in order to give us the supreme witness of his love, to invite us to forgiveness and reconciliation, to teach us how to overcome evil with good. So do not fail to learn the lessons of that Christ whom we encounter at the crossroads of our journey and our whole life, in whom God comes forth to meet us as our friend, father and guide. Blessed Cross, shine always upon the lands of Europe! Allow me here to point out the glory of man, and to indicate the threats to his dignity resulting from the privation of his essential values and richness, and the marginalization and death visited upon the weakest and the poorest. One cannot worship God without taking care of his sons and daughters; and man cannot be served without asking who his Father is and answering the question about him. The Europe of science and technology, the Europe of civilization and culture, must be at the same time a Europe open to transcendence and fraternity with other continents, and open to the living and true God, starting with the living and true man. This is what the Church wishes to contribute to Europe: to be watchful for God and for man, based on the understanding of both which is offered to us in Jesus Christ. Dear friends, let us raise our eyes in hope to all that God has promised and offers us. May he give us his strength; may he reinvigorate the Archdiocese of Santiago de Compostela; may he renew the faith of his sons and daughters and assist them in fidelity to their vocation to sow and strengthen the Gospel, at home and abroad. May Saint James, the companion of the Lord, obtain abundant blessings for Galicia and the other peoples of Spain, elsewhere in Europe and overseas, wherever the Apostle is a sign of Christian identity and a promoter of the proclamation of Christ. 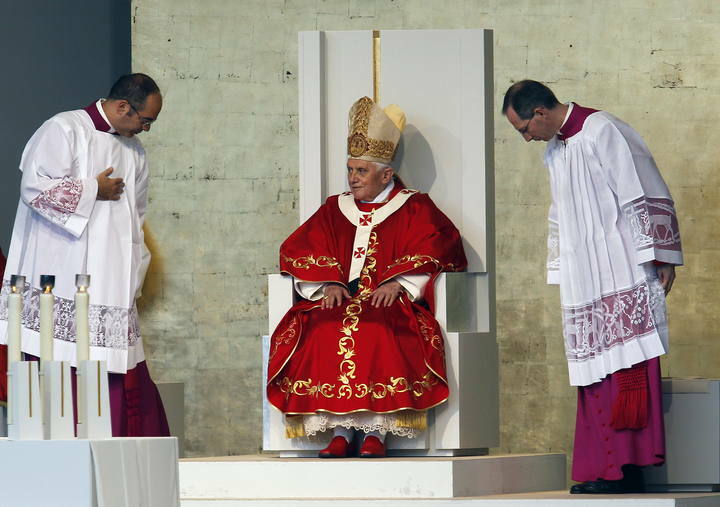 The remainder of Pope Benedict's time in Santiago de Compostela will include a private meeting with the leader of the Spanish political opposition party in the sacristy. He will then make his way back to airport and head to Barcelona.